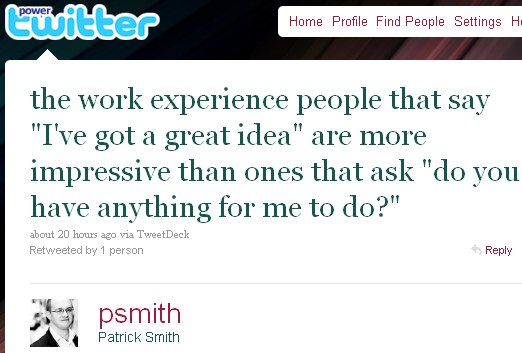 He followed it up by urging workies not to be scared of suggesting ideas; now, Patrick is a kindly sort and also found space in his 140chars to acknowledge the difficultes unpaid work experience types face in a newsroom; I hope those who saw his tweets took the message on board. But it did get me thinking about the workies I’ve seen around newsrooms over the years, where they fitted in to the organisation, and what they got out of it. The newsroom can be a daunting place for a newbie, even one on the payroll, and it’s easy to get overwhelmed and overlooked if you’re joining the bustle for a one-week taster of real world workplaces. When I was reporting or newsdesking, workies – by which I mean journalism college students, not school pupils – tended to arrive in reception at 9am on a Monday morning (because that’s when their letter from HR told them to arrive), ask for the news editor (again, as per their letter) and then, if they were lucky a newsdesk PA came and got them. If they weren’t, they’d sit in reception until a harrassed newsdesker or journalist arrived and let them into the Inner Sanctum – where a pile of national papers would be thrust at them with the line: “We’re all on edition, someone will come and see you soon”. 1. Phone the newsdesk the week before you start, introduce yourself and, even if you’ve already got a start time from whoever arranged the pacement, just check the newsdesk is expecting you then. And check who you should really ask for at reception. 2. If you’re steered to a desk and look through the papers, get the guest login for the computer, and search them online instead – and run some searches for local blogs, forums and social network updates while you’re at it. It’s faster, easier and you’ll feel better looking at a screen like everyone around you, rather than turning pages in a futile search for news. I don’t want to generalise here but I’ll bet most newsrooms don’t revolve around making sure your work experience is a happy and useful one. So at some point a workie needs to approach the newsdesk. You see the phrase ‘brimming with ideas’ time and again in journalism job adverts. However, the word ‘good’ needs to be in front of ‘ideas’ or everyone’s wasting their time. A few, thoughtful and relevant suggestions to pitch are more valuable than a scattergun approach; the latter might grind a newsdesker into saying yes, just to get you to knuckle down and do something, but the finished product probably won’t make it to the page, printed or online. The phrase to avoid is: “Is there anything for me to do?” Find out from the reporters what time the morning madness subsides on the newsdesk and, if you’ve been left to your own devices til then, make your move. Saying “I’ve got some ideas for stories but before I start those is there anything you want me to help out with?” sounds confident and bright. If you want to spend one of your five days working with a journalist or department you’re particularly interested in – like the health reporter, or the business desk – then ask. Also ask if you can attend at least one news conference, to see how the paper is planned. Have some story suggestions, but craft them around what you know is making the local news agenda. So, if the previous week the issue of, say, residents complaining the local council was giving them different bins (like this) then consider how you could move that issue on. Lateral thinking is good; you don’t need to go down the vox pop route. You may aspire to the WSJ but if you’ve got a work placement on your local paper, about the important local issues. Also think about asking the picture or digital desk if they’d like you to do a video report or soundslide, or whether local environment/recycling statistics could make some nice cross-platform infographics – the multimedia skills journalism students learn as part of their studies give them an edge in many newsrooms, and abilities are remembered. Read the paper. And I mean REALLY read the paper. If house style is January 10 and you keep writing 10th Janurary after you’ve been told once, it’s annoying. If you write 600 words when it’s obvious the average length of a lead is 350 you’re wasting your time and newsdesk’s time and patience. Is it ‘mum-of-4’ or ‘mother-of-four’? Is it Cllr, Councillor, Clr, Coun? If you don’t know something, ask the reporters around you or see if you can’t find the style answer in the actual title. Of course, newsrooms need to do right by work experience people as well, by which I mean treating them as embryonic journalists who have aspirations to work in the industry (and who might one day be an editor themselves) rather than ambulatory pieces of the furniture. But some workies don’t do themselves any favours – I’ve previously sent people home for wearing jeans – and a can-do attitude is way more attractive than either world-weary insouciance or projecting an aura of ‘helping out the local rag until The Guardian comes and asks me to rescue them’. The issue of paid and unpaid work experience is a thorny one. I’ve had a couple of newly-graduated journalists work ad hoc shifts, unpaid, because they wanted the experience and bylines. It was informal, and on their terms, and I wouldn’t ever have considered them on the rota, so to speak. It’s not the way I think newsrooms should operate as a habit, but if someone wants to do some days over the summer to boost their profile and CV, then it can be a mutually-beneficial arrangement. However, 1st year students discovering if mainstream media journalism on an average local paper is for them, is a very different thing. ‘Free staff’ is not how a newsdesk tends to see someone whose copy has to be rewritten from scratch to turn the facts into something resembling the English language. I suspect some workies leave their placements thinking regional newspapers aren’t for them; it is hard work, and sliding circulations and cutbacks aren’t the best adverts for a career on the local paper. But it is one of the best, maddest careers you can choose – there aren’t too many jobs where you answer the phone to hear a annoyed receptionist snap: “There’s a man in reception with a dead otter and he won’t leave til he’s seen you”*. Five days – 10 if you’re lucky – aren’t long enough to experience regional newspaper journalism but it is enough time to learn how a newsroom barrels along (on the edge of a catastrophe curve) and how to be an effective operator in a workplace (take your turn in the tea rounds). My advice for journo students on work experience is, I guess, to aim to learn some new things, have an open – and broad! – mind and a few ideas, and see if you can’t have some laughs. Because there are plenty of opportunities for them, and you’ll enjoy your week a lot more. *That really happened, by the way. Great post Alison, thanks for the mention. You have some very sound advice and I hope people read it. It seems to be a very modern problem right now: the sheer amount of people that are willing to work – for free – not just for one or two weeks but for months in the hope of getting a job. I used to go to district council meetings at night and come in armed with a couple of tidbits, which goes down very well when it's something no one on the newsdesk has heard about. I wasn't offered a job, but a few months later a sister daily title did get in touch to see if I'd come and interview for a reporter vacancy – all on the strength of those workie shifts. I'd already moved to London by then but it was a nice moment. And since working in magazines / online media and now events at the Frontline Club, I've worked with many workies at the other end of the relationship – and I've recommended people for jobs and I hopefully will again. I suppose I just want to get the message across to them that (a) the opportunity for them while they're on the placement is limited only by their enthusiam and talent and (b) the placement can be only the start of the relationship. If people want to stay in touch, pitch for paid work, ask for a reference, whatever, then they're welcome to, but it's surprising how many people don't. I've had the complete range of workie experiences, from being told to wrap presents from a paper charity drive (true – they only had one PC with internet access too and banned me from it as I might take a story from a journo) to being asked to cover court by myself and offered a job as a result. Turn up a little early (not too much, say 10 mins), on your first day and look keen – often there will be papers in the reception, pick it up and read it while you wait. More impressive if the editor/journo sees you intently reading their product. Conversely, don't expect too much on your first day. In my experience most editors haven't got round to doing logins etc so you might not get on a computer etc. Try and find a way round this but don't be disheartened if you haven't written a page lead after day one. I always thought going to court or council meetings was good. It shows you're keen, and there's often little fillers you can do which takes the load off the reporter and gives you a crack at things. It also shows your media law knowledge if you're on a course. Plus when there is downtime (a lot in court) you can ask the reporter about the paper, the work etc A really good opportunity to find out more and get some useful tips. If your story gets printed, read it and see how the editor has changed it. Ask why if the changes are not clear (WARNING: do not do this if the editor is on deadline or very stressed etc) so you can learn how to be a better writer. Finally, don't be put off by your first work ex. Mine was woeful as they treated me like rubbish and didn't realise they had a hard working free employee who was half way to being a qualified trainee. The next place I went to did, and I flourished. Some newsrooms are just awful for their treatment of work ex people. If you are determined to make it, try a different paper and see how it goes there. Seriously, I agree council meetings are just great places to pick up things – often the councillors don't seem to grasp that they are speaking in public – and you can pick up great leads that way. I think you hit the nail on the head by saying work experience is the start of the relationship; I've taken people on because I felt there was an investment on both sides, and getting a foot in the door on a placement is one of the best ways to land a job. I'd imagine newspapers are more disposed towards making an offer to someone they know, and who they have some relationship with and confidence in, ahead of a 'cold' interview any time. There's a lot riding on recruitment nowadays – a news editor might wait several months to get vacancies signed off; would they want to take a gamble in those circumstances? Probably not. Peter, I think your advice is spot on and thank you for adding it here. I think it must be disheartening for some people if they've not achieved what they wanted in a few days; the thing is, that's Journalism. It can be lightening fast, or take a while for a story to come together, and sometimes it falls completely apart. I love your suggestion of joining reporters for drinks after work; it's inspired and very true. Throughout my reporting days, shifts often ended in the pub rather than at home, and everyone went along and shared (horror) stories. It really is the best way to get to know people and find out some of the tricks of the trade. I got my first job on a magazine after a week of work experience. On my first day, they stuck me in a different room as someone else was on the spare computer. I was miserable and bored. So on day two I turned up early, parked myself at said computer and made tea for everyone. On day three I needed to find something out so I made some phone calls, copying how the other people in the office talked. I thought nothing of this, but later found out I was the first work experience person ever to pick up the phone and find something out. Most workies just sort of sat there. On day four I asked if I could write a piece for one of their regular pages and bashed through it super quickly because I'd already planned what I'd write before I asked if I could do it. I got a job on day five. A badly-paid, dogsbody job, but a job all the same, and I went on to work for national papers. And I've been amazed by the number of workies I've encountered with no initiative who just… sit there. If I'd just sat there, I'd still be “there” now.